This custom RedShelf eBook was created for students at California State Univeristy, Long Beach. THIS TITLE HAS BEEN UPDATED TO REFLECT THE 2016 MLA UPDATES! Our editorial team has updated this text based on content from The MLA Handbook, 8th Edition. Browse our catalog or contact your representative for a full listing of updated titles and packages, or to request a custom ISBN. When students routinely use their handbook in the course, they see its value, find that its a faster way to get answers than search engines like Google, learn to rely on it as a reference, and are more likely to achieve the goals of the course. And when that handbook is Rules for Writers, you can be sure the advice they find is practical and reliablewith help for composing and revising, writing arguments, analyzing texts, using grammar and punctuation correctly, and working with sources. In revising the eighth edition, Nancy Sommers has woven a new emphasis on reading critically throughout the first section of the handbook, introduced advice for analyzing multimodal texts, and added help for public speaking. New practical Writing Guides support students working through college assignments in a variety of genres. And new peer review advice helps students effectively comment on drafts and apply feedback to revisions of their own work. All of these improvements help student writersbut they also save you time and effort. You can draw from Rules for Writers for planning class discussions, conducting in-class workshops, and providing feedback on student work that they can easily apply. 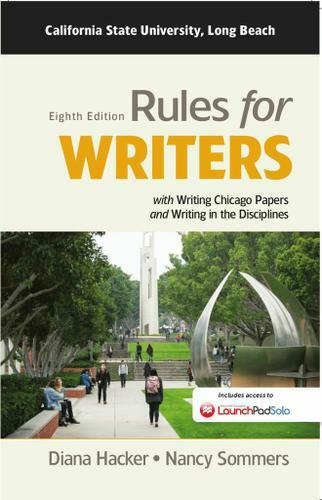 Rules for Writers even comes with a complete instructors manual, Teaching with Hacker Handbooks, with stepped-out lesson plans to customize and sample assignments, syllabi, and rubrics from your peers.